Quem é que já está aborrecida de vir cá à procura de uma atualização e esta menina não vos faz a vontade? Pois eu sei, eu sei que algumas já desistiram de vir cá, tal é a pasmaceira que Julho foi neste blog ahah! Bom, já cá estou! O regresso não foi fácil não! Estive (e a ainda estou) com muitas horas de sono atrasadas mas vou vencer o jet lag! Para quem não sabe, ou não me foi seguindo pelo Instagram, estive de férias por Miami (e outros sítios) porque fui fazer um cruzeiro durante uma semana. Tenho algumas coisinhas para vos mostrar dos sítios por onde passei. Mas nada como voltar ao início que, verdade seja dita, parece que foi há uma eternidade! O que vos posso dizer de Miami? Miami é muito diferente de tudo o que já vi. Para além do calor extremo e húmido (Jesusss, aquele calor de fazer o cabelo colar-se todo ao pescoço sabem? De parecer que precisam de tomar banho mal chegam à rua, de sentirem o ar pesado sempre que respiram. Sim é isso mesmo!) É uma cidade muito muito nova e rica na verdade. O nível de vida é muito muito acima do que já vi. A cidade é bonita, com edifícios maravilhosos e com vistas lindas. Super limpinha e nota-se claramente o poder de compra em todo o lado - carros, iates, casas enormes. Bom é isso, não é a cidade que mais me entusiasmou mas gostei muito de conhecer. As pessoas são muito extravagantes mas simpáticas e espontâneas. Param na rua para te elogiar ou perguntar de onde é o que tens vestido, de onde é a tua mala ou que adoram o teu cabelo. Coisa que nunca me tinha acontecido antes ahah!Vou mostrar-vos mais sobre Miami nos posts seguintes. Who is bored of coming here looking for an update and this girl doesn't please you? Well I know, I know some of you have already given up of coming here, such is the lack of posts during this July! Really when was this blog so bored like in this month?! Well, here I am! The return was not easy! I've been (and still am) with many hours of sleep delayed but I'm going to beat the jet lag for sure! For those who don't know, or don't follow me through Instagram, I was on vacation in Miami (and other places) because I went on a cruise for a week. I have a few things to show you from the places where I've been. But nothing like going back to the beginning that, truth be told, it seems like it was ages ago! What can I tell you about Miami? Miami is very different from anything I've ever seen. In addition to the extreme and humid heat (Jesusss, that heat that makes your hair sticking all around your neck you know?) That heat that makes you feel like you need a shower after 30 seconds on the street ahah!) It is a very very new and rich city indeed. The standard of living is much higher than I have ever seen. The city is beautiful, with wonderful buildings and beautiful views. Super clean and you can clearly notice the buying power everywhere - cars, yachts, huge houses. Well, this is not the city that most excited me but I really enjoyed meeting. The people are very extravagant but friendly and spontaneous. They stop in the street to praise you or ask where you are dress from, where your bag from, or just to tell you that they love your hair. These kind of things had never happened to me before ahah! 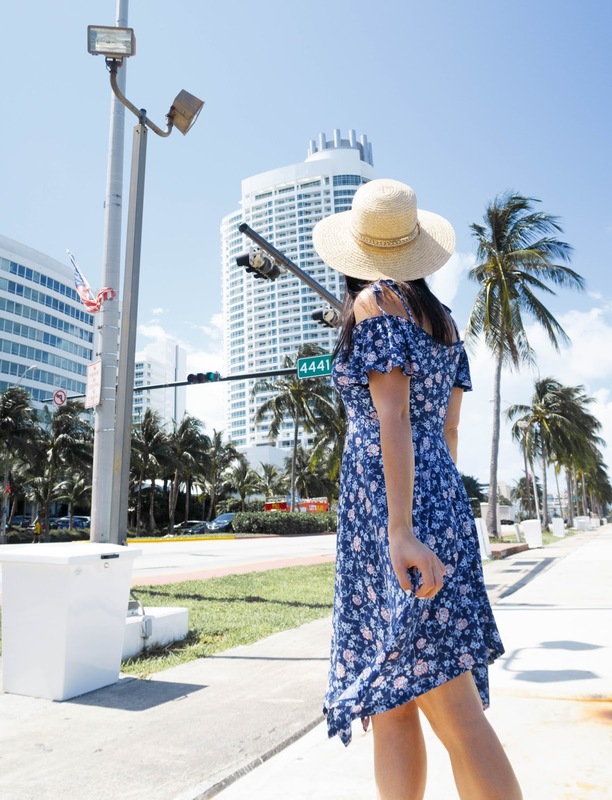 I'll show you more about Miami in the following posts. Que fotografias tão lindas!! Estás maravilhosa :)) Deve ter sido uma viagem muito gira mesmo. Com fotografias com esse fundo tudo fica espectacular!! Acompanhei pelo instagram, sortuda! Fui-te acompanhando pelo Insta e adorei tudo que colocas, fiquei tão encantada que despertou em mim o desejo de uma aventura destas! Beijinhos, espero que tenhas gostado de tudo. Bem vinda de volta, macaca! Que saudades das tuas fotos e dos teus textos sempre tão ricos. Que linda! Quero muito ir a Miami. Quero sonho!! Quero tanto visitar Miami! Estás linda! I've never been in Miami but have read that it is an amazing place to go for the summer! Que look lindo, adorei as fotos. 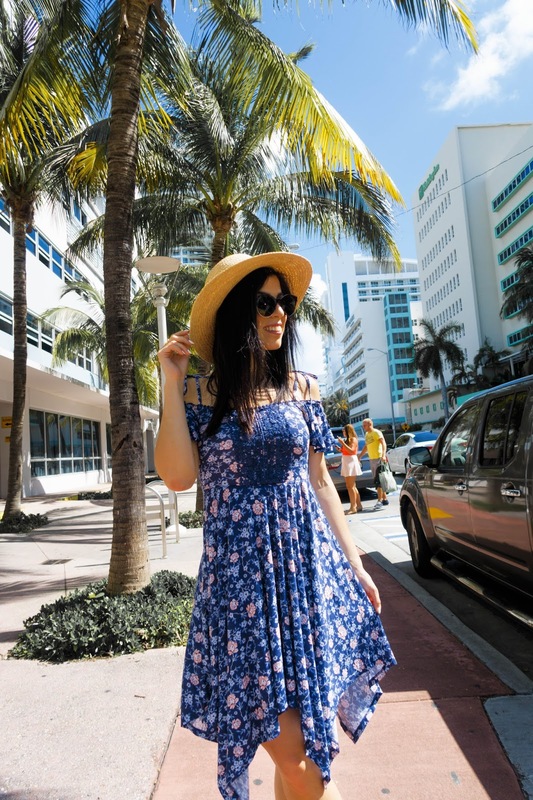 This floral dress looks so so good on you and is perfect for Miami! I just got back from there and it was an incredible time! Thank you! Ohh did you? I hope you had an amazing time there! This dress is so cute and perfect for Miami! Love the print! 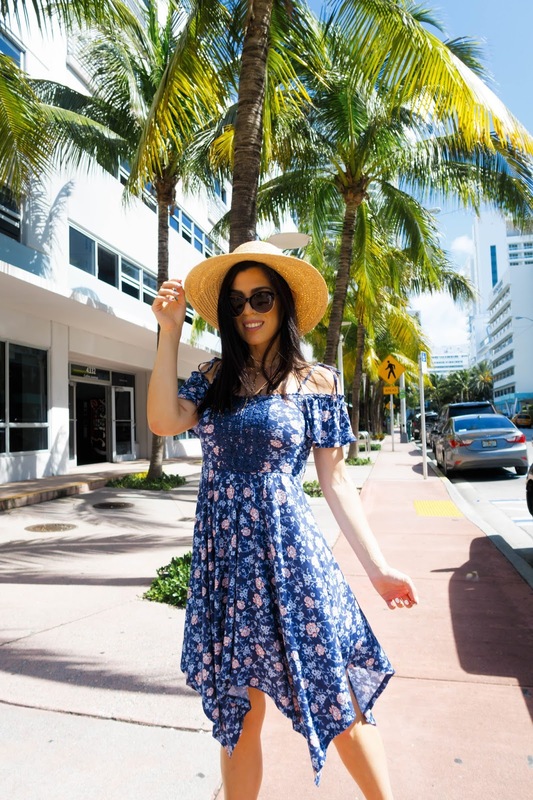 This is the perfect dress for Miami! So beautiful and I love the asymmetrical hem! Adoraria ir a Miami! Espero que tenhas aproveitado ao máximo.